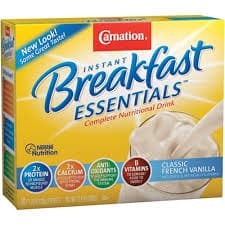 Today you can print out this amazing printable coupon on Coupons.com for Carnation Instant Breakfast deal. The coupon takes $4 off 2 boxes of Carnation Instant Breakfast. You should definitely use this coupon at Walmart where you can rack up the biggest savings! Usually, Carnation Breakfast Essentials are priced under $5 at Walmart. So, by taking $4 off, you’ll basically end up paying a dollar for the second box. The savings here are absolutely incredible.